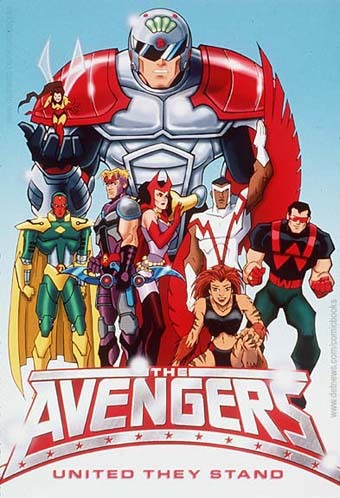 The Avengers: United They Stand is an animated series from 1999 starring Marvel Comics' superhero team, The Avengers. Unfortunately, due to plans for live-action movies, Captain America, Iron Man and The Mighty Thor couldn't be used as full members (Thor only appeared in the opening credits, and Cap and Iron Man made single-episode guest appearances), leaving Ant-Man as the the leader of the Avengers. The rest of the roster included The Wasp, The Vision, Scarlet Witch, The Falcon, Hawkeye, Tigra, and Wonder Man. Marvel briefly published a comic-book tie-in. Written by Ty Templeton, he managed to tell some accessible, fun, classic Avengers stories. He even managed to perfectly update "Even an Android Can Cry" and work in a guest appearance by Devil Dinosaur and Moon Boy. This show ran for only 13 episodes on Fox Kids. Action Girl: Tigra, Scarlet Witch, and the Wasp are all formidable heroines on the team. Adaptational Modesty: Most likely because this was a kid's show, Tigra's bikini got replaced with a tanktop and briefs. Advertised Extra: When the complete series was released on DVD to cash in on the popularity of the live-action Avengers movie, Captain America and Iron Man were given the most prominent real estate on the cover. This is despite them only appearing in one episode each. A Father to His Men: Ant-Man tries to be a reasonable and caring leader to the rest of the Avengers. A.I. Is a Crapshoot: Not just Ultron, but some equipment of his that somehow fuses with plant matter and comes alive in "Remnants". Always Someone Better: Ant-Man feels this towards Captain America in his guest episode. Animesque: The use of Powered Armor and lengthy Transformation Sequences especially. Attack Pattern Alpha: Used all over the place. There's even a "Containment maneuver #12". Badass Normal: Hawkeye has no powers, but is a highly skilled archer. Big-Bad Ensemble: Ultron is the primary villain in the opening two parter and appears in a few more episodes. The Zodiac are also a recurring threat, playing out machinations in a couple episodes and taking the lead in the finale. Big Red Devil: Invoked with Taurus, who's actually a minotaur but is also really red. Cats Hate Water: More specifically, Tigra the tiger-woman hates water. She is revealed to be afraid of water in "To Rule Atlantis". Covers Always Lie: Wonder Man and the Vision in the same lineup? HAH. Da Chief: Mr. Sikorski is the main authority figure the Avengers work with and he tends to be belligerent towards them. Dead Star Walking: A non-lethal example. Wonder Man is prominently featured in the opening titles, but is incapacited in the first episode and stays that way for most of the series. Demoted to Extra: Captain America, Iron Man and Thor, in spite of being very prominent members of the team in the comics, are reduced to cameos as portraits and/or one-time guest appearances. Fantastic Racism: The witches of New Salem are pretty much known for being persecuted in history, yet they call out Scarlet Witch for being a mutant. Freudian Excuse: The finale reveals Wasp became a superhero because her father was a weapons manufacturer. She couldn't stand that her life of privilege was paid for with other people's suffering, so she was driven to help people. Happily Married: Ant-Man and the Wasp are married and love each other dearly. Hidden Elf Village: New Salem, Scarlet Witch's old training grounds. Invocation: The Scarlet Witch: "Winds of Destiny, Change!" Jerk with a Heart of Gold: Hawkeye is often brash and obnoxious, but he values his friends. Jerkass Has a Point: Sikorski can be pretty obnoxious at times, but he is right that the team sometimes lacks discipline and can be needlessly reckless in the field. Hawkeye failing the President in the first episode is one such example. Lethal Joke Character: Egghead may be a ridiculous villain, but he has just enough knowledge of manipulating Pym particles to nearly kill Ant-Man. Man Behind the Man: Swordsman, who convinced his old pal Hawkeye to join his group, was acting under orders from Taurus. Mythology Gag: Like in the comics, it's mentioned in "Command Decision" that Captain America and Falcon have a history of working together. No Ending: The series ends with the Zodiacs getting what they were after, and able to turn the Zodiac Key, while Wonder Man's powers have been rendered unstable due to the Zodiacs' Doomsday Device, and Ant-Man votes to drop him from the team. That's it. Not So Different: The people of New Salem started that community because of the prejudice and hatred they received from normal humans. Scarlet Witch insists she can relate, due to being a mutant. Off-Model: Various examples. At the end of the two-part series premier, Falcon and Vision's big induction ceremony involves them getting to wear the team's "A" insignia for the first time, signifying that they've truly become Avengers. The problem? They were already shown wearing it in a few shots earlier in the episode. The Omniscient Council of Vagueness: The Zodiac, a group of constellation-themed foes who have a fiendish plot in the works. Not that that plot was ever really explained, though, but it's apparently a big deal. Opponent Switch: The Avengers do this to defeat the Masters of Evil. Organic Technology: In "Remnants", some technology Ultron left lying around somehow turns into this when fused with the local flora. Overshadowed by Awesome: Hank spends Captain America's guest appearance grousing because practically everyone is singing Cap's praises and listening to him. The Plan: See What the Hell, Hero?. When asked, what if it didn't work, Ant-Man replied "You know, that never even crossed my mind." Red Herring: The Monster of the Week in "Remnants" looks to all the world like Man-Thing, but is actually plant matter fused with Ultron's technology. Ret-Canon: The comics' Falcon briefly wears the armor he wears on this show. Robot Buddy: Vision is an android ally of the Avengers. Sacrificial Lamb: Wonder Man, who's very quickly put into a coma while setting up the Vision's origin. Say My Name: "HENRY!" said by Wasp whenever she or Ant-Man are in peril. Shout-Out: Ant-Man in his microship maneuvers between the keys on a keyboard, looking for all the world like the trench run. Sixth Ranger: The first episode establishes Ant-Man, Wasp, Hawkeye, Tigra, Wonder Man, and Scarlet Witch have been members for sometime. Falcon and Vision are formally added to the team at the end of the second episode. Of course, they were in the opening credits, so it's not a surprise. So Proud of You: "Command Decision" ends with Captain America saying Hank has done him and the other founding members proud. Stock Footage: The transformation sequences are always reused in every episode to save money on animation costs. See below. Hawkeye's old circus costume from "Comes a Swordsman". And unnecessarily so. Nearly the whole teamnote Vision is inexplicably spared, while Tigra is already in her element gets jungle-themed outfits in "Remnants" that wind up more like this for some reason. Transformation Sequence: Ant-Man, Wasp, Hawkeye and Falcon's snap-on armor appears over their bodies when they prepare for battle. We Will Meet Again: In his final appearance, Ultron is sent crashing into an abyss, but he promises to escape and face the team again one day. Western Zodiac: A whole group of themed villains from outer space, with Taurus the acting leader. What the Hell, Hero? : There are several instances of the heroes being chewed out for making bad decisions. Hawkeye in the first episode for leaving his post and the president getting hurt. Later Ant-Man for seemingly giving in to the demands of Kang when he took Wasp hostage. Though in that case it was a plan which worked, so everybody was cool with it. Winds of Destiny, Change: The Scarlet Witch. Trope Namer. Ultron can swap out every part of his body for whichever reason, giving him several different appearances. He's even missing his feelers in "Remnants". Kang barely looks anything like how he appears in the comics. You Have Failed Me: At the end of "Comes a Swordsman", Taurus punishes Swordsman for his failure by ordering his minions to tear him into twelve pieces. You Killed My Father: This show's Baron Zemo has been under the impression that Captain America killed his father ie. the previous Baron Zemo. In actual fact, it was his own shots reflected off the vibranium shield that did it.